Hydrangea macrophylla "Hanabi"®™ Pride of Place Plants Inc.
International Press prize winner at Plantarium '98 in Boskoop, The Netherlands. The cultivar originated from Japan. It is a native selection discovered and named by Mr.Takeomi Yamamoto,currently the President of the Japan Hydrangea Society. 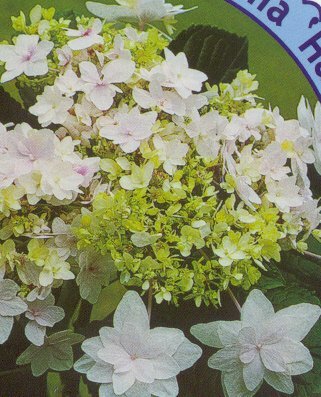 It was originally discovered near Yokohama and is a mutant of Hydrangea macrophylla f. normalis. While" Hanabi"t.m. is a rare multi-petaled flower, the plant has many of the same characteristics unique to the variant species.Hydrangea "Hanabi "t.m. has had a distinct past. A company in Japan,obtained the plant and sold quantities in Japan under the name" Hanabi of Sumida". Mr. Yamamoto with no re-course"let it be as it was". A plant breeder from Japan sent it to the World Exhibition of Flowers held in Kumming , China. It won first prize. A nurseryman from Europe took home a few cuttings and has now distributed the cultivar to his colleaques with-in the European Nursery Trade.These plants have now arrived in North America to the amazement of Mr.Yamamoto. Pride of Place Plants has obtained permission from Mr.Yamamoto to promote and offer these plants freely. We have,and will continue to promote and recognize Mr.Yamamoto for his contribution to Horticulture. We have applied for U.S. Trade Mark protection for the name" Hanabi"
We had also prepared U.S.plant patent application for early submission,but as a result of others and a new policy practice by the U.S.P.T.O. examining group, the application may be rejected. 35 U.S.C. 102( b) states,if there is prior printed publication or plants of the invention were previously made available prior to application,the application will be rejected. The cultivar name means fireworks in Japanese, in honor of its brilliant little white flower umbels. This cultivar falls into the lacecap group of H. macrophylla - which have flattened flowerheads, rather than the Hortensia type, which bear flowers in a full, spherical arrangement. 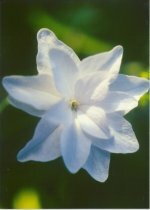 The flowers on this cultivar are double and pure white. The deciduous foliage is an emerald green with a large tear-drop shape. Hydrangea's are versatile, useful in containers as well as shrub borders or as specimen plants flowering in mid to late summer. This cultivar is easily rooted by leafy softwood cuttings taken in mid-Spring. They do well under mist and respond markedly to indolebutyric acid treatments. Leaf-bud cuttings can be used if propagating material is scarce, two cuttings being obtained from the two opposite leaves at each node. The media used can be of many profiles allowing for good drainage maintaining a favorable moisture level. How to Grow: All hydrangeas grow in full sun or light shade and do best in a moist but well drained soil supplemented with peat moss, leaf mold or compost. Big-leafed hydrangeas require acid soil. They do well in seaside gardens and big-leafed hydrangeas flourish near the shore. The time to prune hydrangeas depends on the species. The big-leafed hydrangea blossom from large buds formed on previous season's growth; thus any pruning, usually needed only to control height, should be done immediately after flowering.